The report of the Policy Workshop Can institutions learn? Scaling-up innovation in urban regeneration settings. Barcelona, Bologna and Naples is now available at this link. 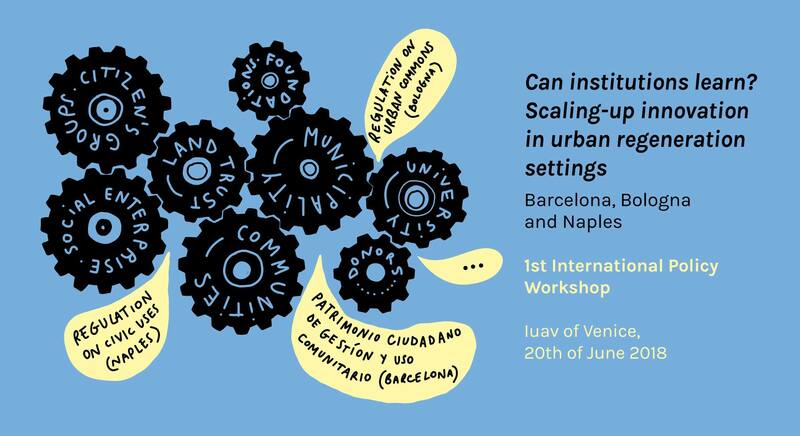 The report highlights cross-cutting elements and main differences among Barcelona, Bologna and Naples in the process of institutional learning in urban regeneration settings. The Policy workshop has been held in Venice on the 20th of June with more than 60 participants among students, practitioners, scholars and citizens. Citizen-driven innovation increases the possibilities for a broader range of people to become directly involved in all stages of social and urban action, though at the same they appear to replace the government in the provision of urban services. Local governments need to find ways to provide public value in accountable and transparent ways, in contexts where social and spatial barriers often prevent the involvement of the most vulnerable groups. Increasing socio-spatial polarization questions social cohesion in local societies worldwide. Against this backdrop, following the 2007 financial crisis welfare and public investment for urban regeneration have significantly decreased across most European cities; dissimilar top-down revitalisation strategies have resulted in new urban dynamics and urban tensions, gentrification processes and social exclusion. As a result, the neighbourhood is now the privileged level of policy intervention. Community-based initiatives and the institution coproduce with the aim to change power relations and socio-spatial inequalities. In a growing number of neighbourhoods diversity, affordability, and social inclusion are increasingly at risk due to gentrification and real estate speculation. The capacity of community based responses to mitigate the effects of negative change needs to be further assessed particularly when the State is constantly retreating. Self-organization practices can create important spaces of autonomy, but at the same time coproduction with local institutions has different impacts and outcomes on the institutional as well as the community based organizational structure. A special thanks for the Instant Reporting to Marta Andrei, Riccardo Buonanno, Ivana Cucca, Chiara De Grandi, Noemí Elena Julián Villar, Verena Lenna, Giacomo Longo, Giulia Lucatello, Alessia Macchi, Alba Nabulsi.